The ink blot, traditionally used in psych wards, now available in a home edition. Insanely clever and obsessively fun. Ever wonder if your boss is crazy, your spouse is nuts or your best friend is delusional? With Rorshöck, you can find out for sure. 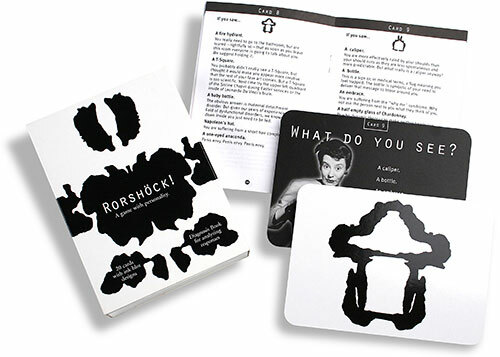 Rorshöck comes with 20 ink blot cards and an accompanying diagnosis book. What, already feeling anxious? Don’t worry. This personality test is strictly for fun.